Tom Anderson has made a dramatic career transformation. 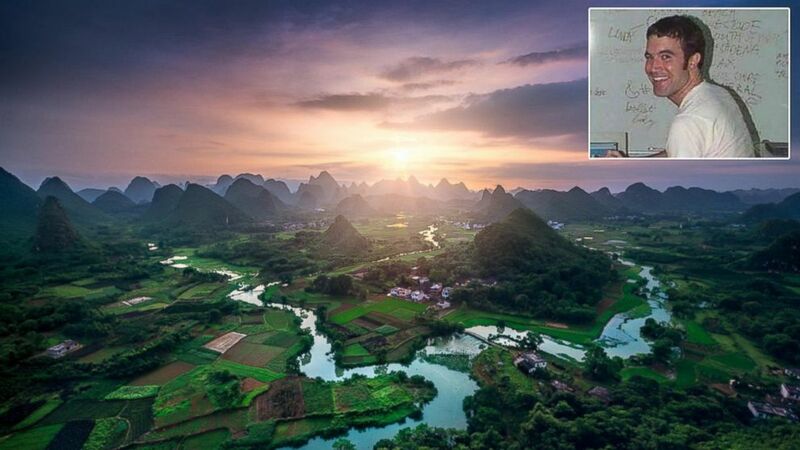 camera (Tom Anderson) Tom Anderson, known online as Myspace Tom, posted this photo to Instagram on June 6, 2014 with the caption, "Awesome view in Guilin, China. It's been raining so climbing up here was slippery and dangerous but what an amazing place! Stayed through sunset and saw the valley light up with fireflies in the dark... Truly a memorable evening :-)"
Tom Anderson is an astonishingly good landscape photographer, for a guy who's arguably most recognizable from a grainy, postage-stamp sized photo on Myspace. That's right: Tom, everyone's first friend on Myspace (and a co-founder of the social network), has been spending the past few years of his life shooting National Geographic-style landscapes, and the results are impressive. "I was very happy with my results from the beginning," Anderson told ABC News. "That's highly unusual for me." An aerial photo of Manila, Philippines, posted to Instagram by Tom Anderson, Nov. 6, 2013. His experience with photography began at Burning Man 2011. At the notoriously dusty, hard-to-photograph festival, Anderson began making frames that were good enough to inspire him to continue shooting. In 2012, he told the photography blog PetaPixel that he was "kind of blown away" by the quality of the images he was shooting. He had come along for the ride with friend and photographer Trey Ratcliff, to whom he now credits his quick development as a photographer. A couple kisses in a photo from Burning Man 2012, a year after the Burning Man experience that inspired Anderson to pursue photography seriously. But though he co-founded one of the most popular early social media websites, the notion of Anderson as a single-minded, success-oriented individual in the mold of many Silicon Valley entrepreneurs is a bit flawed. It's hard to underplay his success at Myspace, but he admits to having diverse interests and passions throughout his life. "If you knew me before Myspace, you'd probably thought I'd have been a scholar teaching philosophy in a university my whole life. If you met me before college, you'd probably have thought I'd be a musician for my entire life," Anderson said. "I like change." Anderson takes a selfie in Taiwan, Oct. 25, 2013. In 2005, News Corp. bought Myspace for $580 million, and in 2009 Anderson left the advisory role he had maintained after the sale, reported Bustle. Armed with the windfall from the News Corp. sale, he kept busy, making a cameo appearance in an Adam Sandler movie and aiming to develop a baseball team in Las Vegas that ultimately never advanced beyond Anderson's planning stages. But the photographic revelation of Burning Man 2011, combined with his ability to travel free of job or income constraints, has kicked off a period spent photographing landscapes, while continuing to learn from Ratliff and information available online. He travels with friends when their schedules align, and will sometimes take trips because of weather conditions or events in a country, like Thailand’s annual lantern festival in Chiang Mai, or his most recent trip to the Grand Canyon spurred by a weather forecast that included lightning. A photograph shot on Anderson's most recent trip -- to the Grand Canyon in Arizona -- posted to Instagram Aug. 30, 2014. Though his photos draw from the natural beauty of the places he visits -- he described waiting patiently for the right composition and lighting -- he explained part of his aesthetic does come from processing the images afterward. "The less the camera is able to capture what you're seeing in a scene, the more editing it needs," Anderson said. "I'm not necessarily trying to represent nature exactly. I'm trying to make something beautiful like a painter would." Though he's been everyone's friend on the Internet, Anderson admits a particular personal quality that lends itself to landscapes -- rather than portraits or photojournalism. "On the rare occasion I get people in my landscapes and scenes, it's mostly never planned. I'm a little shy about it," Anderson said. Anderson photographed the Yi Peng festival in Thailand, posted to Instagram Jan. 14, 2014. Sporadically, humans populate his landscape photography as he becomes more comfortable with the craft. As he has developed as a photographer the process has become more natural, and he'll offer a smile and a gesture to potential subjects while he's photographing in the field. He also admitted as he grows, he is shooting fewer images he likes -- a symptom of elevated standards. There are also photos "nothing like what I'm doing now," that he has begun shooting, though he is making sure the new batch of work is up to his standards before posting them. As someone whose work impacted the development of the Internet in the 2000s, and a photographer himself, the rise of photo-sharing apps and the democratization of photography isn't something that worries him. "I think people are feeling more artistic and creative with something like Instagram that makes editing easy. That's a good thing for sure," Anderson said. "I meet so many people that are interested in trying photography and I think any boost to one's creative life is a boon." And as far as coming out of "retirement," Anderson is content to let his inspiration guide him rather than jumping back into the tech world because of the expectations of others. When asked if he was interested in a full-blown lifestyle change from photographer to corporate innovator, his answer was "honestly, no." "Many people really seem to want that from me. On the one hand it's flattering," Anderson said. "I'll never say never, because more than anything I like the idea that anything can happen. I don't know exactly where my life will lead. Adventure and the unknown has always been appealing to me." Balloons float above the old city of Bagan, Myanmar, in a photo Anderson posted to Instagram Dec. 18, 2013.